We offer a complete range of pumping equipment from an American manufacturer CORKEN Inc. for stationary and mobile applications of LPG and other liquefied gases. Corken Coro-Flo is a regenerative turbine pump, a variation of centrifugal pump, and is used for stationary applications: automotive filling from aboveground tank, cylinder or bottle filling, vaporizer feed. Advantages of this pump are quiet operation without vibrations, simplicity of service and longer pump life. Coro-Flo pumps are offered in close-coupled design or mounted, with possibility of ANSI flanged connections. Model 150 for two dual hose or multiple dispensers. Those models are designed for aboveground and underground LPG filling stations, cylinder filling and vaporizer feed. Coro-Flo pumps are built for continuous duty service. Pumps are mounted aboveground. They are very easy to maintain. direct mount (to C-face motor). All turbine pumps must have an external bypass valve! 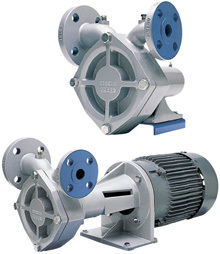 Corken Coro-Vane is a sliding vane pump and is the most popular type of pump in the LP gas industry for generating high flow rates (up to 1,514 l/min). The most common uses for LPG: loading and unloading of terminals, carousel cylinder filling, barge /railcar unloading. 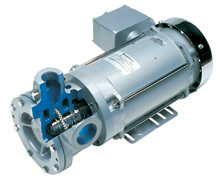 Coro-vane pumps are offered with v-belt or direct-drive mounting options. The majority of models are equipped with an internal relief valve. 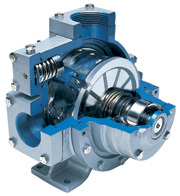 All sliding vane pumps must have an external bypass valve! Z3500 is 3” sliding-vane LPG pump designed for stationary and truck applications, such as loading and unloading transports. Z3500 retrofits Corken model 1021 pump and other 3” competitor’s pumps with little or no change in piping. Z4500 is 4” sliding-vane LPG pump designed for filling big transports (LPG semi-trailers) or a few smaller tanks at the same time. The pump can fill two of 11,5 m3 transportation tanks in less than 20 minutes. Advantages are higher flow rates than other 3” or 4” competitive pumps, pump’s operation at a higher RPM without damage and easy service.